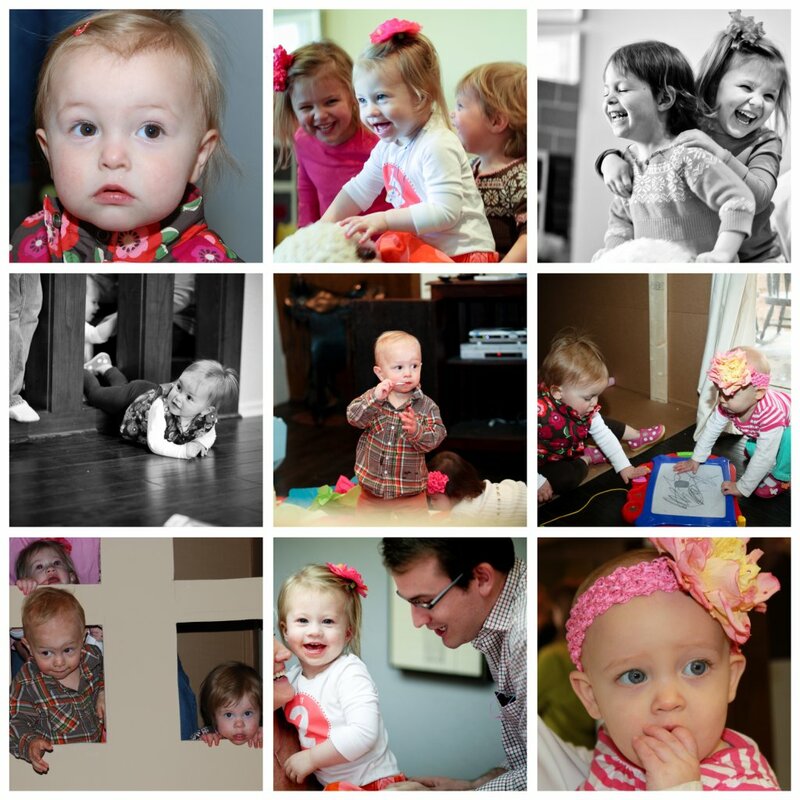 It was so fun having family and friends come in town for Ella's party. Everyone was such a big help with getting everything ready for the party. I couldn't have done it without them. Thank you so much to everyone that helped! The night before prep party was almost just as fun as the actual party! We made 4 boxes of cupcakes, 200 jello shots, 150 caramel apples, hundreds of tiny number 2 sugar cookies and went through 8 cans of icing! I'm a little bit of a perfectionist when it comes to party stuff and can get a little crazy:) Everyone was so great and just went with all my craziness! Kristen helped me cut out 3 different versions of signs because I just couldn't ever decide on what colors I liked best and she helped with the most annoying job of laminating the water bottle labels. My wonderful mom came up with the cute tiny 2 cookies and they weren't the fastest things to make. She spent so much time on them to get them perfect. Anna and Morgan helped with them too and I just loved the way they turned out! My fabulous mother in law Dawn popped out 350 mini cupcakes like it was nothing and she had a natural talent when it came to dipping those caramel apples. My uber creative cousin Christi came through on just about everything for me. She always has a great idea up her sleeve and she is like a machine when it comes to getting stuff done. I ran a 10 minute errand and by the time I came back she had 50 water bottles laminated and covered, she's amazing. 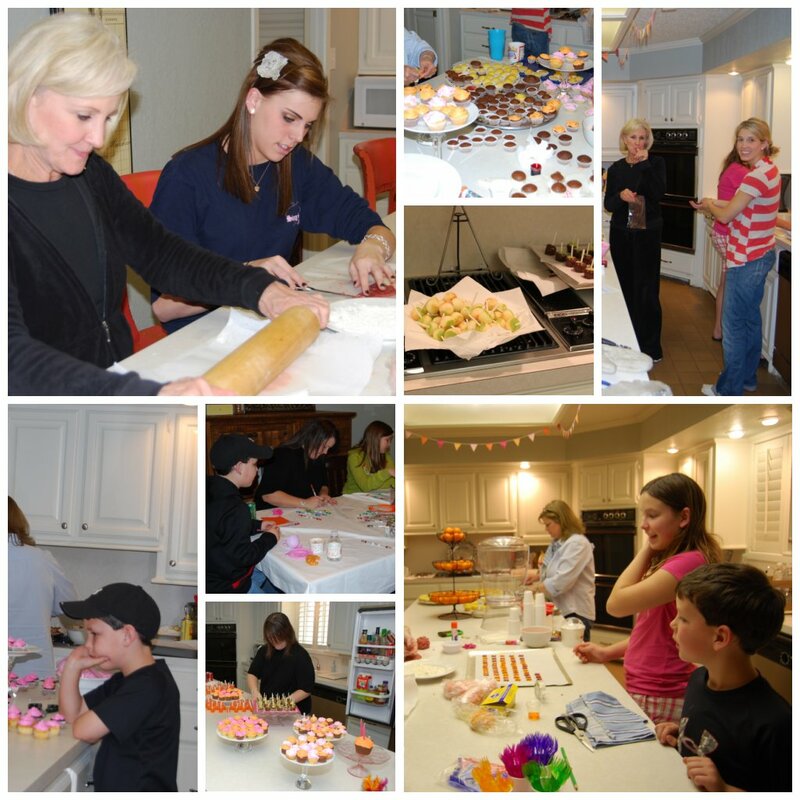 Everyone but me pitched in when it came to icing the cupcakes and they looked so great! Bob, Matthew and Anna went on more than one after midnight errands for me and I never heard a complaint from anyone. I have the best family! The tiny jello was the biggest hit with the kids. I'm pretty sure Avery had 20 of them! I bought tiny 1.5oz cups at party city and filled them with orange jello. Once the jello set, I stuck a tiny spoon in them. Super easy, fast and very kid friendly. The tiny caramel apples were the biggest hit for the adults. I'm pretty sure I had 20 of them, they were so good! You take a granny smith apple (this kind seems to work the best) and use a melon scooper to get mini apples. I got about 8-10 mini apples out of one big apple. I bought lollipop sticks from Micheals and cut them in half. I stuck one in each apple then I squeezed moisture out of each mini apple with a paper towel. I tried many different dips for the apples and found that melted chocolate worked the best. Caramel wouldn't stick directly to the apples because the white part of the apple is all that there was to hold the caramel. Chocolate chips worked great and then I drizzled them with caramel. We rolled a few of them in health bar bits and some in mini m&ms too. Let me just say that I love Lowes. When I came up with the idea of creating a tiny town I began to call around for places that could give me large boxes. Lowes had wonderful customer service and they were willing to help me get as many boxes as I needed. I left one side of the boxes open for kids to go in and out of easily. The roof on the McDonald's/Starbucks dipped down a little so Bob braced it with wood supports and they were very sturdy. 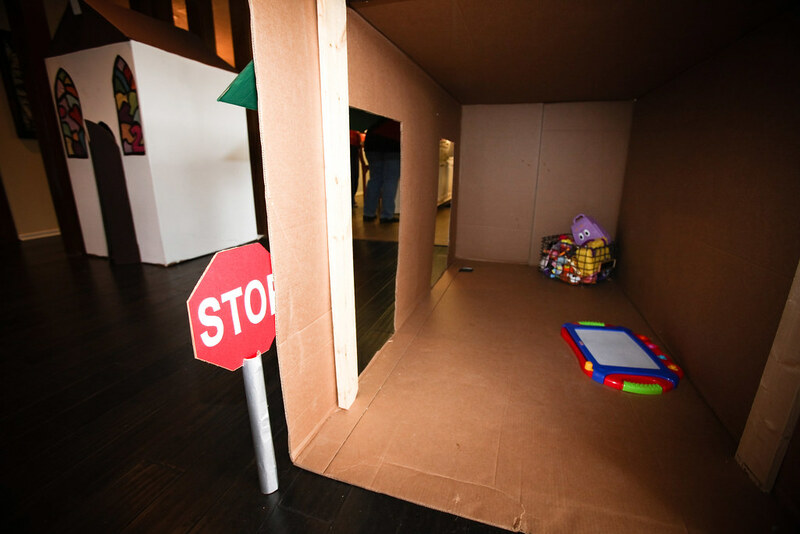 I had so much fun painting all the boxes and turning them into a tiny town for Ella. Ella was on cloud nine with all her visitors that came to see her. Jo Jo, Pop-pa, Aunt Anna, Mamie, Pappy, Cousins Christi, Morgan, Matthew and our sweet friends Lindsay and Kinley. Thank you everyone for being here to help celebrate Ella's birthday. 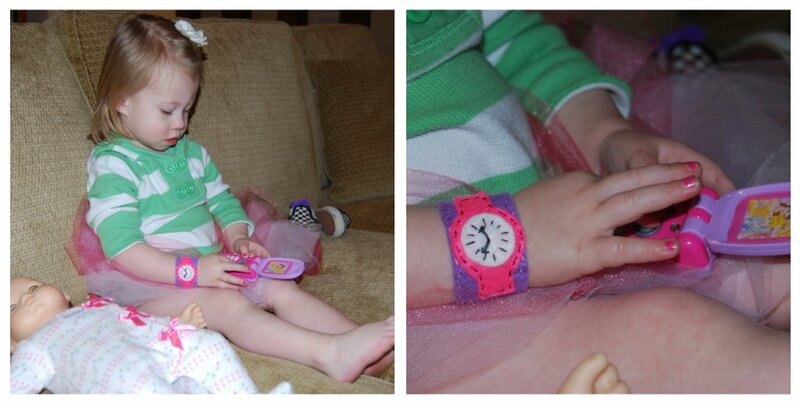 Lindsay made Ella some the cutest fabric blocks, a fantastic bag and this adorable watch! I don't have a pic of the blocks and bag so go here to see how fabulous they are. Ella loves them all and she looks so grown up with her new watch on. 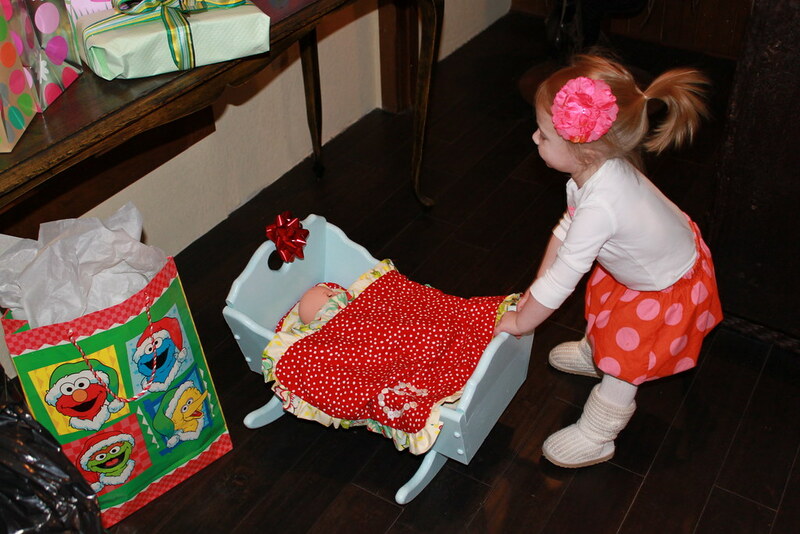 Ella fell in love with Celeste's gift immediately! 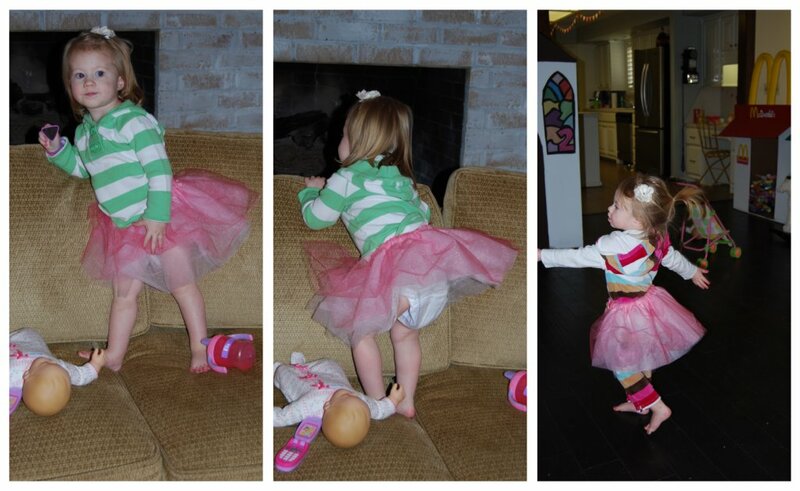 As soon as Ella saw Celeste carry it in, she ran to get her baby doll. She rocked her baby to sleep in the fantastic baby bed Celeste got her, and she made the bedding! It is so cute! And let me just throw out another thanks to sweet Brittany for taking so many amazing pictures of the party. Here is one of my favorite pictures that she got. 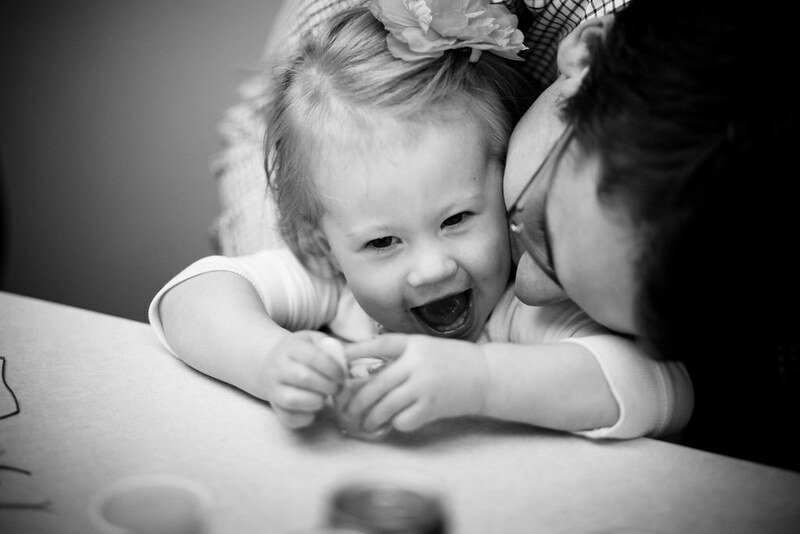 Uncle George (aka Jordan, Brittany's hubby) always puts a smile on Ella's face. So sweet. 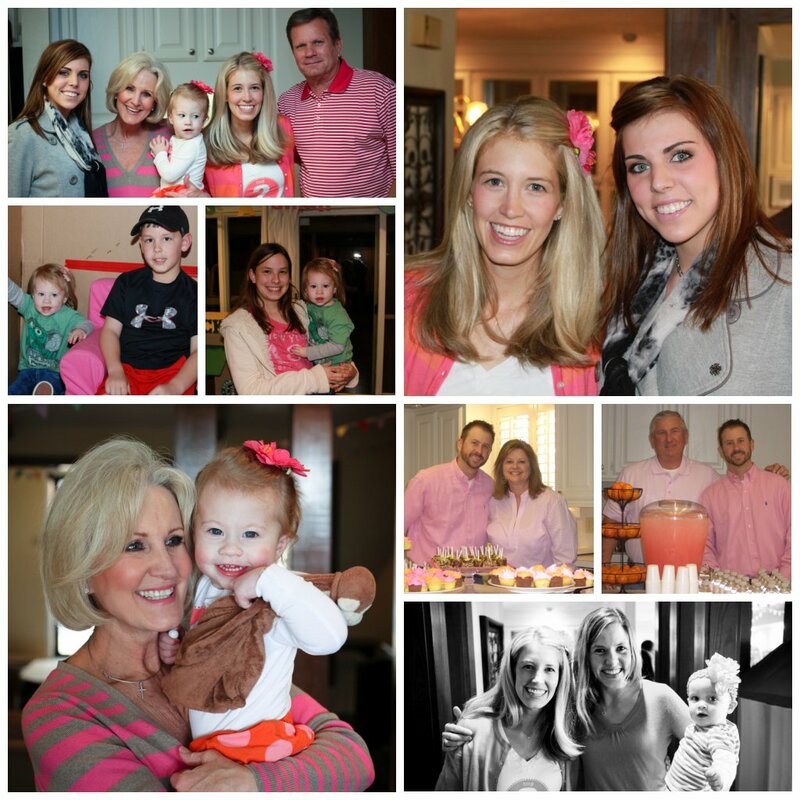 You did such a great job with this party and I love the recap post! I will definitely be posting this party if that is ok?! Y'all had such a great time I can tell!!!! Again, amazing!!! Tiny two was fantastic! Such a fun time...your vision and committment to a theme is amazing! Always love it! Oh. My. Stars. This is the cutest "little" birthday party I've ever seen! Wowza! You should put yourself out for hire! !